2. Open the file titled Common Features.gcf in the Tutorial Files folder by choosing File > Open… to bring up Figure 2.92. This is a new AutoFeature window. For now, just explore the various options in this window but leave the entries and formatting intact. Entries defined in the left-hand panel can be selected, then the other parameters can be edited. Users can define a name, comments and the sequence GCK should use to identify the feature. The sequence field is case sensitive, allowing precise control over the search routine. Nucleotides entered in UPPER CASE in the search string must exactly match the target sequence (i.e. conserved regions). Alternatively, nucleotides entered in lower case can be used where the sequence may be allowed to have mismatches, and the value entered into the Max. % mismatch allowed for those characters can defined for the query. 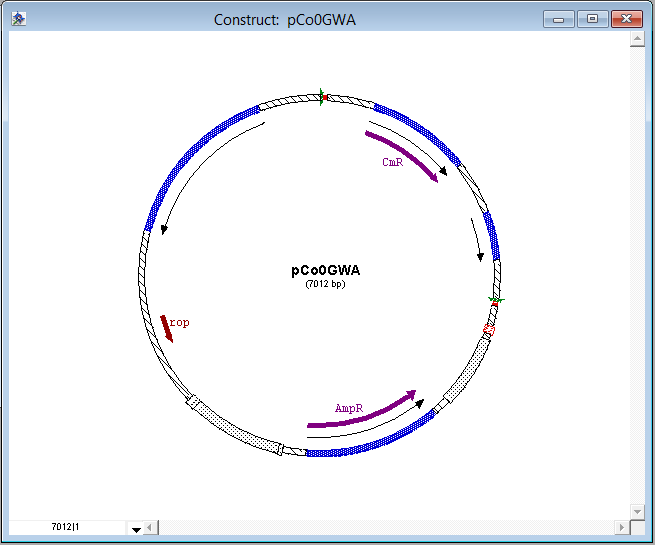 Checking the protein sequence option will also show the region as a protein, and display the corresponding amino acid sequence in the sequence view of the construct. For more details, see Tutorial 20: “Find Sequence”, page 2-87. 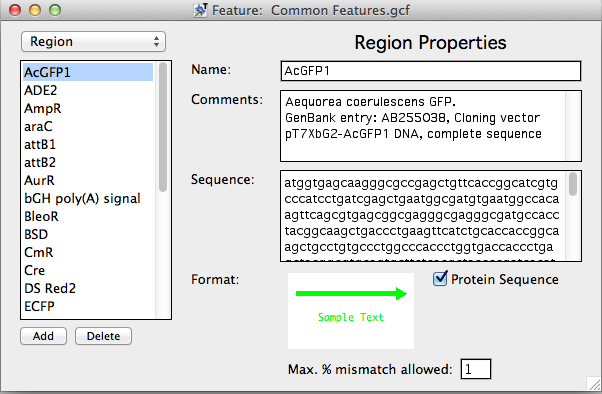 The Format box shows a sample of the formatting that will be applied to the segments of DNA that match the feature. Click on the Format box to highlight, then the color, font, line type and fill patterns can be changed by selecting new formats through the Format menu. New entries can be added and deleted to the section on the left, and AutoFeature Files can be saved using the File > Save / Save As… menu options, allowing users to create a collection of AutoFeature Files that might be useful in different projects. Now that you have a basic overview of the AutoFeature File, let’s use it to find features in a GCK construct. 3. Open the file called pCo0GWA.gcc in the Tutorial Files folder by choosing File > Open…. This will be the construct we will annotate with our Common Feature File. Let’s see how we might use AutoFeatures additionally for comparison. 4. Select the Construct > Features > Mark AutoFeatures… menu option to bring up an Open dialog. 5. Navigate to the Tutorial Files folder to select the file titled Common Features.gcf and press Open. 6. GCK will use the features defined in the Common Features file to search pCo0GWA for matches, and will apply the associated formatting. The result should be as in Figure 2.93. Note how some features are redundant (i.e. the regions corresponding to chloramphenicol resistance and ampicillin resistance). Because this might become confusing to have the same regions and/or segments marked twice, let’s backup and make a clean Generation of this file using Chronography (covered earlier in Tutorial 7: Chronography – Tracking Cloning History, page 2-31). 7. First, we’ll need to remove the AutoFeatures we just marked. Select the Edit > Undo Mark AutoFeatures. As long you haven’t performed additional manipulations within the construct window (or switched to the sequence view) you should have access to Undo Mark AutoFeatures which will remove the previously applied formats. 8. Next, we will create a new generation, with all the current segment and region data hidden, from which we will be able to Mark AutoFeatures. First select Tools > Chronography > Start New Generation to bring up Figure 2.94. Fill in the options for Name and Comments as shown above, and make sure that none of the options for keeping displayed segments, regions, site markers or comments are selected then press OK (this gives us a ‘clean’ map, with no segments/regions or formats displayed, so our AutoFeatures become the ‘only’ features). 9. Now let’s mark the Common Features in this view. As before, select the Construct > Features > Mark AutoFeatures… menu option to bring up an Open dialog. 10. Again we’ll select the file titled Common Features.gcf and press Open. 11. The progress bar appears, counting down the features scanned in the file, and GCK should have applied the formatting from our Common Features file to the pCo0GWA construct. The result should be as in Figure 2.95 below. You can explore the features identified by selecting a region / segment and choosing Construct > Get Info… (command-I/ctrl-I). For comparison, you are also able to toggle back to the previous view (i.e. the GenBank features that were marked in the file when first opened) by choosing Format > Chronography > Show Previous Generation, or selecting the generation titled “GenBank Features” from the Format > Chronography submenu. You can learn more about AutoFeatures in the “AutoFeature Window” chapter, beginning on page 7-1. This concludes the tutorial. Close any open windows, but do not save any changes you may have made so that others may work with these sample files. 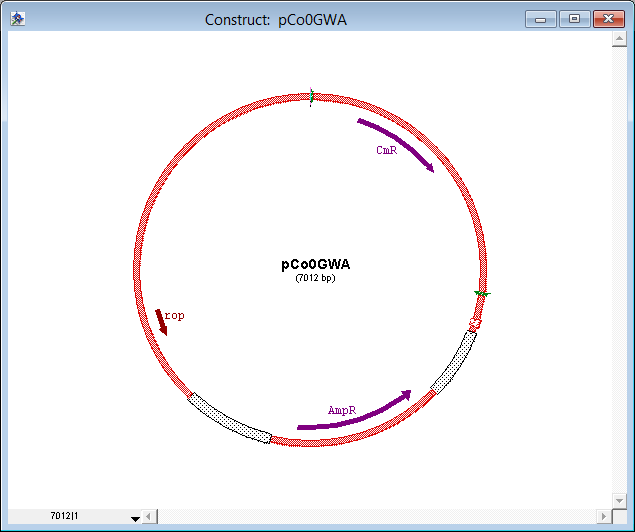 This entry was posted in gene construction kit tutorials and tagged Automark GCK features, enhancers, features, Gene Construction Kit Tutorials, genes, oligos, primers, promoter. Bookmark the permalink. Trackbacks are closed, but you can post a comment. Like marking common enzymes sites, Marking Autofeatures is somthing many people, I imagine, will want to do immediately, every time they map a new construct. The default data file for enzyme marking is the one listed as the topmost .gcl file in the GCK data folder, when listed by name, as far as I know. Is there a way to have a Common Features (.gcf) file selected as a default, so one doesn’t have to navigate to find one, every time one wants to use Mark Autofeatures?